At first notice one thing: Talking about energy always means talking about motivation, too! A player who is hardly motivated will find it very difficult to play at a high energy level. 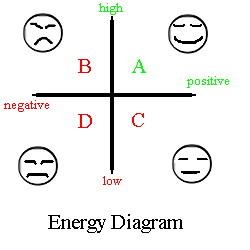 Understanding the difference between high and low energy is relatively easy. A player at a low energy level doesn't care much about the game's outcome. Perhaps you will know this situation from days you haven't been motivated much or when you are tired or bored. High energy means full concentration, awareness of the game and lots of motivation. Negative energy is a little bit difficult to understand. It occurs when you absolutely want to win and try really hard for it. You don't have fun along the game, it's more like pushing and working hard, fighting all along. It's a kind of "Thomas Muster Game" when you compare it to Tennis. High positive energy is more like typical "Andre Agassi": Having fun along the game, everything is going easy. Much concentration and awareness, sure, but with a touch of "easy - going". Most sporters describe this high positive energy simply as "fun" along the game. You love darting, you like playing, even if it's a tough match. The important thing on this subject now is that three energy situation types (B-D) effect your game, allowing you to play only at a particular percentage of your 100 per cent capabilities. Let's have a look at the different types. This surely is the worst case that can happen. Immediately try to raise your energy! Bad concentration, bad thoughts In this energy state you usually can't play at more than 50-60 per cent of your capability. Nearly the same as type D, but it is a little better to move to the type A optimum. Second best energy state. High concentration, but very negative thinking. Normally combined with tension. Most players can achieve up to 80 per cent of their maximum capability. Best energy state. Can be best described as "having fun on what you are doing". 100 per cent play possible. Try to concentrate more. Try to have fun. Don't you like darts playing? I'm sure you love it, otherwise you wouldn't be there! This maybe difficult, but it is possible. Try to control these negative thoughts you have. Isn't it fun simply playing darts?! Refer to the "Tension" issue in the archive section below, you may find useful help there, too. Negative energy often occurs when the game isn't running too good for you. Good players manage to stay in a positive energy sector, no matter how the game's standing is. If you are angry because your game is a little (or a lot) faulty, then try to encourage yourself. Mentally strong players see their mistakes as a chance to show their strength and still win the game. That's one of the key points in sports psychology, and the only way to perform that way is to play at the "A" energy state!